Hi everyone, welcome to my December blog. Firstly, I would like to thank all of you for your continued support and for continuing to read these posts after all this time - I'm actually really humbled to see the ongoing support that my little site and blog has. Thank you to all, so very much. Can anyone tell me where this year has gone? I'm fairly certain it wasn't that long ago that we were in January. 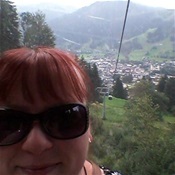 Yes, I do remember my amazing fortnight in Kitzbuhel, Austria back in September - really? that was 3 months ago? I honestly don't know how time is going by so fast. On a more regular note, work wise, my drafts are coming along well. I've been drawing up a small family tree to help with my back story on a piece I'm working on - it will make sense in the end I hope. Who knew drawing a family tree could be so complicated?! I'm still working on my new writing course. I've been busy uploading pictures from my phone and camera ready to use in my first assignment - I'm writing a travel article that you might normally see in a magazine. Of course, I have a lot of pictures from Austria, but I also have some from Edinburgh and Belfast too. I'm almost at the point of nervous excitement in reagrds to my assignment, I like doing the work, but I'm nervous to send it in to be marked - like I'm at college all over again. Are any of you doing interesting courses? I'd love to hear about them. For my "To Read...Or Not" section this month, I'm looking at Dark Fantasy series of novels. More over, these books I'm going to take you through this month all have an edge to them that make you feel like it could be real. Now this doesn't matter whether it talks about a futuristic outlook on the world (think Hunger Games and Divergent) or whether the subject is Vampires in a sleepy Southern town (True Blood/Sookie Stackhouse novels and Morganville Vampires series); the point is that whatever you're reading could actually happen or be happening somewhere in the world. So tht's just a little update from me this month, Whilst I don't celebrate the holidays (personal reasons), I would still like to say that I hope you all have a very Merry Christmas and a Happy New Year. Enjoy your time with your family and friends, please don't drink too much. Certainly don't drink and drive and I'll see all of you in the new year. Have a great holiday season and as always, Keep Reading!